MUMBAI: The 44.4 m tall Polar Satellite Launch Vehicle (PSLV) with the fully integrated moon-bound Chandrayaan spacecraft was shifted to the launch pad in the new secondary launch area at Sriharikota at about 7pm on Friday, ISRO chief spokesperson S Satish said. The much-awaited lift-off, first international lunar mission led by India, is slated for takeoff at 6.20am on October 22. Satish said the vehicle carrying the rocket moved at a snail's pace â€” a few metres per minute â€” taking more than an hour to reach the launch pad from the vehicle assembly building. The movement of the vehicle was extremely slow to ensure that everything was intact with the rocket and the mooncraft. "Even though it rained at Sriharikota on Friday evening when the rocket was shifted, it was no cause for concern. Forecast suggests that weather on October 22 will be benign and launch will take place," said Satish. Other space officials have repeatedly said that even if it rains on the morning of October 22, the rocket will lift off. "The launch rehearsal was held at 10 p.m. and everything went off fine. It is like a dress rehearsal ahead of the October 22 launch," a scientist said declining to be named. The fully integrated Polar Satellite Launch Vehicle (PSLV-C11) with the lunar spacecraft atop was moved to the launch pad at the Satish Dhawan Space Centre at Sriharikota in Andhra Pradesh, about 80 km from Chennai, and off the Bay of Bengal. "Scientists at the Indian Space Research Organisation (ISRO) centre at Sriharikota and at the tracking centre in Bangalore were involved in the operation," he said. The scientists are keeping their fingers crossed that the weather on Wednesday would be fine. While met officials have predicted rain on the day, scientists say it will not affect the launch. "Only cyclone and lightning will be a problem," the official said. 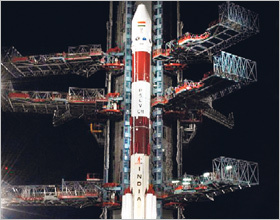 ISRO director S Satish said: "The 316-tonne launch vehicle with the 1,380 kg spacecraft was fitted to the launch pad. The launch exercises, including testing, are in progress. About 1,000 scientists and technicians are working round-the-clock to prepare for the 52-hour initial countdown from the wee hours of October 20." With 11 scientific instruments (payloads), including six foreign and five Indian, Chandrayaan was mated with the launch vehicle late on Thursday for mandatory checks and the final journey. MUMBAI: With India heading for the moon, can Mars be far behind? The answer is a no. On Friday, the Indian mission to Mars got a fillip with ISRO's 11th plan including the flight to the Red Planet as a part of the document. India's decision assumes significance in the background of Mars becoming a favourite target after the moon for the US, Russia and the European Space Agency. In fact this week Russia began preparations for a manned mission to Mars. With Japan and China also expected to join the race to Mars, Indian space scientists feel that India cannot afford to lag behind. On Saturday, confirming the country's plans to embark on a mission to Mars, director of the Ahmedabad-based Physical Research Laboratory (PRL), J N Goswami, told TOI that if the project is finally approved "India will carry out scientific activities on Mars in the international context." Said Goswami: "Our plan envisages imaging Mars only through an orbiter. We have no immediate plans for a landing mission." Goswami is the principal scientific investigator for the "Chandrayaan-1" mission, India's maiden flight to the moon, slated for lift off either on April 9 or April 23, 2008. He said the Indian Mars mission will focus on basic science like studying the Martian atmosphere, the ionosphere, the magnetic field, the dust storms and the weather. The project also includes searching for water, he said. Contacted at Bangalore, ISRO officials said a lot of analysis needs to be done before the mission becomes a reality. "The logical extension after the moon is Mars." an official added. The moon mission has been described as a precursor to more ambitions interplanetary flights to be undertaken by India. Former President A P J Abdul Kalam had stated that a Mars mission will have economic value. Though a precise time line for the ambitious six-to-eight month flight to Mars has yet to be worked, indications are that if the Centre endorses the project, the mission could lift off around 2015 using the three-stage Geo-Synchronous Satellite Launch Vehicle (GSLV) which is already operational. The Mars orbiter that has to be designed and made is expected to weigh around 500 kgs. The cost of the mission will be Rs three billion. The mission to moon has a price tag of Rs 386 crore. ISRO chairman, G Madhavan Nair, has said, "Mars is emerging on our horizon." 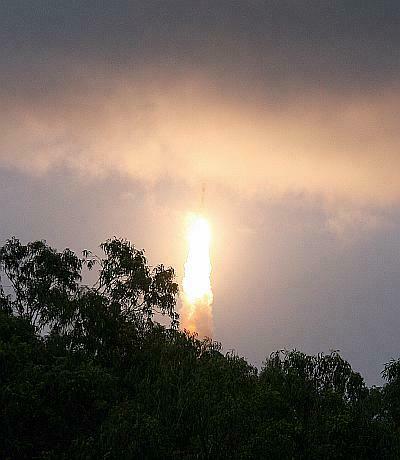 SHRIHARIKOTA: The bright fire of the Polar Satellite Launch Vehicle (PSLV) C-11 lit up India's historic moment at 6.22 am on Wednesday as the country's maiden moon mission, Chandrayaan-1, blasted off into a cloudy sky over the Satish Dhawan Space Centre (SDSC) in Sriharikota off the Andhra Pradesh coast. If all goes well, India will become the sixth member of an elite club of moon-faring nations, including Russia, the US, Japan and China and the European Space Agency. Preceded by incessant rain and fear of postponement, the Chandrayaan-I launch was declared successful by the chairman of the Indian Space Research organisation (ISRO), G Madhavan Nair, when the launch vehicle completed the first stage in a little over 18.30 minutes, embarking on a two-year mission to map the moon's surface and minerals below and also detect the possibility of water/ice in the polar regions of the moon. â€œIt is a historic moment. We achieved every parameter. The velocity and altitude was sufficient. The sky was clear for the blast-off in spite or rains for this remarkable achievement. I congratulate the people involved in the mission,â€� Nair said in a brief speech made immediately after the launch. The 1,380-kg 44.4-metre tall PSLV released Chandrayaan, which carries 11 payloads to study various aspects of moon, into the transfer orbit within 18.20 minutes. Chandrayaan- I took to the skies at the end of 49-hour final countdown, which had begun on Monday. This was the 14th PSLV launch. However, the mission can be declared successful only on November 8 when the satellite enters the moon's targeted orbit at nearest and farthest point of 100 km from the lunar surface, Nair said. â€œWe will be following several procedures over next two weeks to put the satellite in the intended orbit,â€� he said. Meanwhile, President Pratibha Patil and Prime Minister Manmohan Singh and former president APJ Abdul Kalam, the father of India's missile programme, joined the rest of the country in congratulating the scientists who have propelled India's space journey into a new league. A "small" fuel spill mishap when the Polar rocket with the Chandrayaan-I spacecraft atop was being fuelled created a near "scare" during the final countdown for the launch of India's maiden unmanned moon mission, ISRO Chief Madhavan Nair said. This was revealed by Nair who earlier in the day spoke of how space scientists at the Sriharikota spaceport faced an "ordeal" after rains pounded the area and surrounding parts for nearly five days. "Yesterday, we had a small mishap during filling operation when some of the fuel spilled over from one of the courses of the ground system and this created almost a scare," Nair said. The ISRO chief also said launch personnel had to clear the "pad" and then carry out repairs before proceeding with the blast-off preparations. "We had to take a tough decision as to how much of fuel had to be loaded, how much as to be unloaded and number of operations to be carried out simultaneously which we have never done earlier," he said. "We lost 10 hours in the countdown yesterday due to inclement weather and almost lost the hope of making the launch. But working against all odds ISRO team has won the game," Nair said. North-East monsoon usually peaks over the eastern coast around this time of the year. "It was an ordeal and never before we had such horrible weather just ahead of the launch date," he added. next few days are more important then the successful launch ! PSLV had never failed for india. BANGALORE: India's first unmanned moon spacecraft, Chandrayaan-1 has entered the lunar transfer trajectory and is heading to an apogee of 3,80,000 KM as ISRO scientists on Tuesday carried the fifth and final orbit-raising manoeuvre. "Chandrayaan-1 has entered the lunar transfer trajectory and is heading to an apogee of 3,80,000 KM, expected to happen on Saturday evening, the time at which the lunar orbit insertion manoeuvres are planned to be carried out," ISRO spokesperson S Satish said. During the crucial manoeuvre on Tuesday at 4.56 am, the spacecraft's 440 Newton liquid engine was fired for 145 seconds. "Today's manoeuvre is one of the crucial and important milestones in the Chandrayaan-1 mission", Satish said. ISRO said the spacecraft is being continuously monitored from the Spacecraft Control Centre at ISRO Telemetry, Tracking and Command Network (ISTRAC) here with support from Indian Deep Space Network (IDSN) antennas at Byalalu on the city outskirts. Since its launch on October 22 by PSLV-C11, all systems onboard Chandrayaan-I spacecraft are performing normally, ISRO said. Chandrayaan-I would approach the Moon on November eight and the spacecraft's liquid engine would be fired again to insert the spacecraft into lunar orbit, the space agency said. The United States, the former Soviet Union and the European Space Agency comprising 17 countries already have their flags on the moon. The Indian tricolour is painted on all sides of the 29-kg Moon Impact Probe which is attached to the main orbiting spacecraft, Chandrayaan-1, which was launched on October 22. The inclusion of the MIP as part of the Chandrayaan mission came at the suggestion of former President A P J Abdul Kalam, a former rocket scientist, during the International Lunar Exploration Working Group conference held at Udaipur in November 2004. The Indian tricolour has been hoisted on Mount Everest and Antarctica. And now it will be on the moon though it will not be hoisted. The flight of the MIP on Friday is expected to be a forerunner to the second Indian moon mission, Chandrayaan-2, which will carry a Russian rover and alander slated for lift-off between 2010 and 2012. The crash landing of MIP will help in assessing future soft-landing technologies. Chandrayaan project director Mylaswamy Annadurai explained to TOI on Friday that at about 8 pm on Friday, a command will be flashed to the MIP from Isro's telemetry, tracking and command network (Istrac) at Bangalore for it to detach from the orbiter. "The MIP will separate and with its three instruments, zoom towards the lunar south pole at a velocity of 1.5km per second," he said. "At Istrac's mission control room, we will immediately come to know that the MIP has separated from the orbiter. The MIP's flight path will first take it over the Malapert crater for about nine seconds and then crashland near the Shackleton Crater about 25 minutes after its detachment from the orbiter. Malapert Crater is not far from the Shackleton crater," he added. Annadurai said that after this, the orbiter will fly in the opposite side and thus data will not be immediately available. "The downloading of data from the MIP to the orbiting Chandrayaan and then to the ground station will start once the spacecraft comes over the north pole of the moon. It will take a couple of hours for the data from the MIP to be downloaded and processed," Annadurai said. He said that once the MIP crashlands on the moon, its own survivability and that of the three instruments will be in question. The probe uses solid propellants. "India's physical presence on the moon with the tricolour will be assured," he said. India's moon mission Chandrayaan [Images]-1 was a dream come true for every Indian and it was a perfect launch. But, since the last few days, ISRO scientists have been noticing that there is a slight rise in temperature on the surface of the Chandrayaan. The multi-layered insulated blanket on the Chandrayaan maintains the temperature between 0 and 40 degree Celsius. However, due to moon summer, the ISRO noticed that there had been a 10 degree rise in the temperature on the surface. ISRO scientists, who reassure that there is no cause for panic, add the temperature is expected to cool off in the next two weeks following which things will come to normal. The immediate fall-out due to the rise in temperature will be that the high energy X Ray Spectra Meter and the Sara (Sub KeV Atom Reflecting Analyser) will not be switched on immediately. Following the launch, the nine instruments being carried aboard the Chandrayaan had been switched on, but the remaining two as mentioned above will be switched on only once the temperature comes down. ISRO says that it will be better to switch on these two instruments once the temperature comes down as these are high-voltage instruments. For India, this is a relatively new concept considering the fact that this is the first moon mission. ISRO had been gathering details about moon summer from other countries which have had moon missions in the past. However this time it is a first-hand experience for ISRO. Ahmedabad: Known for globetrotting, the world, it seems, is not enough for the Gujarati community. Jay Patel will soon boldly go where no Amdavadi has gone before: space, the final frontier. Jay Patel, 29, is set to be the first Gujarati to tour space.Patel, 29, who was born in the city and is set to be the first Gujarati to tour space, belongs to a diamond merchants' family based in New York. He has interests in the hospitality business and is fascinated by aviation. His 18-hour space flight may take place in November or by January 2010. Hollywood star John Travolta, Patel's neighbour, is likely to be his co-passenger.Joining Patel and Travolta on the Space Van, a craft belonging to the United States-based PanAero Inc, will be Russian realty magnate Sergei Polonsky. Space Van 2010 has secured an in-principle approval from NASA, and preparations are on for the November launch. "I was informed by PanAero last week that the got approval from NASA," Patel said. "This is a great feeling. Preparations for the flight are in the final stages." His enthusiasm for the flight has been intensifying since 2005, when he paid the passenger fare of $2,00,000 (about Rs10,411,244). "As soon as I heard about the flight, I knew I had to be there," Patel said. "I am doing this for India, so that we continue to be part of the world's most ambitious projects." "Travolta is known for his passion for flying; I have a private pilot licence and Mr Polonksy is a keen aviator," Patel added. BANGALORE: Indian Space Research Organization (ISRO) Chief K Radhakrishnan on Wednesday said the configuration for the new moon mission 'Chandrayaan-2' is being finalised and added that it would be launched by 2013. Chandrayaan-2, which will be a joint effort between ISRO and Russia, will consist of a lander and a rover for a soft land on moon. The rover will move on the surface of the moon and pick up samples of rocks and soil and conduct a chemical analysis on it. The data would then be sent to the spacecraft orbiting above. "We are finalising the configuration for Chandrayaan-2. This mission will have an orbiter, which will carry the lander and a rover. The lander will bring the rover to the surface of the moon and during the time it is there, (it) will take some samples to be analysed in the orbiter and back to the earth. In the orbiter we will have certain instruments, we are finalising which are those to be put there. It is about 50 kilograms of mass. There is a scientific team which is looking at the requirements and possibilities and also... from Chandrayaan-1 experiment," said Radhakrishnan, on the sidelines of the launch of a book titled 'Mission Moon - Exploring the Moon with Chandrayaan-1' here. Space scientists present there delved on colonisation of the moon. "The lunar environment neither has an atmosphere nor a magnetic field, so the radiation from the sun can directly hit us and severely damage our cells, which can cause cancer. So you need to get into areas where you can avoid radiation; therefore, the concept of tunnel came in. We are trying to look at tunnels where one can get in and live. Though virtually from a big civilisation we will all become cavemen again," said Kasturi Rangan, former ISRO Chairman. ISRO launched Chandrayaan-1 on October 22, 2008, joining the Asian space race in the footsteps of l China and reinforcing its claim to be considered a global power. The cuboid shaped Chandrayaan-1 carried the U.S. space agency NASA's Moon Mineralogy Mapper, or M3, which found water molecules all over the moon's surface. The findings were further corroborated by three other reports. Scientists have detected more than 40 ice-filled craters in the moon's North Pole using data from a NASA [ Images ] radar that flew aboard India's [ Images ] Chandrayaan-I. NASA's Mini-SAR instrument, lightweight, synthetic aperture radar, found more than 40 small craters with water ice. The craters range in size from 2 to 15 km in diameter. The finding would give future missions a new target to further explore and exploit, a NASA statement said, adding it is estimated that there could be at least 600 million metric tons of water ice in the craters. "The emerging picture from the multiple measurements and resulting data of the instruments on lunar missions indicates that water creation, migration, deposition and retention are occurring on the moon," Paul Spudis, principal investigator of the Mini-SAR experiment at the Lunar and Planetary Institute, said yesterday. The new discoveries show that the moon is an even more interesting and attractive scientific, exploration and operational destination than previously thought, he said. Aboard Chandrayaan-I, the Mini-SAR mapped the moon's permanently-shadowed polar craters that are not visible from the earth. The radar uses the polarisation properties of reflected radio waves to characterise surface properties. According to the findings which are being published in the latest issue of the Geophysical Research Letters journal, results from the mapping showed deposits having radar characteristics similar to ice. "After analysing the data, our science team determined a strong indication of water ice, a finding which will give future missions a new target to further explore and exploit," Jason Crusan, program executive for the Mini-RF Program for NASA's Space Operations Mission Directorate, said. The space agency said these results are consistent with recent findings of other NASA instruments and adds to growing scientific understanding of the multiple forms of water found on the moon. The agency's Moon [ Images ] Mineralogy Mapper discovered water molecules in the moon's polar regions, while water vapour was detected by NASA's Lunar Crater Observation and Sensing Satellite. Mini-SAR and Moon Mineralogy Mapper are two of 11 instruments on India's first unmanned mission to the moon -- Chandrayaan-I.